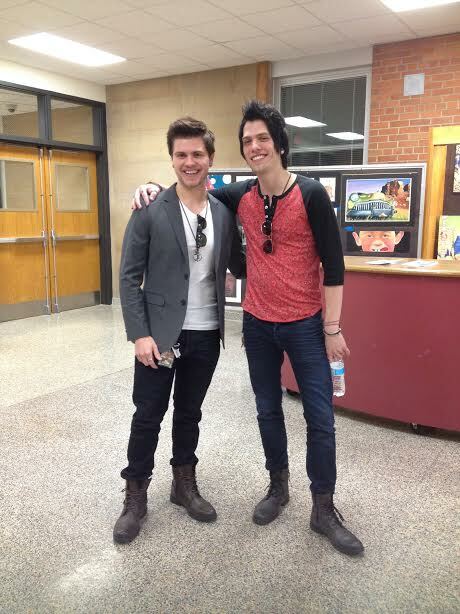 The other week I was lucky enough to be the judge for Craig High School Talent Show in Janesville, Wisconsin with one of my best friends, James (follow him on Twitter, he’s a cool dude @JamesMilbrandt). This seems like such a small role, but it really meant a lot to me. As a kid, I remember my dad taking me to this same talent show to watch the bands and entertainment. It was the first talent competition I had ever been to and I remember how obsessed I was with it for the coming weeks. I thought of all the acts as celebrities and admired every performer. My dad and I sat down in the front, critiquing every act after they performed and decided our favorites. At the time, I had never listened to “Heavy Metal” or “Screamo” music, but there was a metal band that we were blown away by. Their skill as a band, technicality, and showmanship was far better than anyone else that night. We were dead set on them winning first place. When they lost, I remember being so upset because of the judge’s disinterest in the music style and not actually focusing on what the “Talent” contest was all about. I knew that I had an open mind for everything and was so disturbed by the judge’s decision that I wanted to go in and change the results myself, based on my own opinions and observation. Every year after that when I saw advertising for the show I always thought of that night with my dad. Fast forward ten years… and who wouldve known! I got to influence the decision myself of the same show I’ve been hung up on through the years and I couldn’t be happier with the results. That little boy buried in the audience who left the show unsettled ten years ago was now the man sitting in the judge’s chair. Funny how life works… :). Moral of the story – You have just as much a right as anyone else to do whatever it is you want to do, its just a matter of going for it. You can’t change the past, but you can start working now toward the future. Take control yourself. YOU be the judge.